In its 117th year, the American Royal Livestock Show celebrated a record setting event, with more livestock shown than in the last five years. 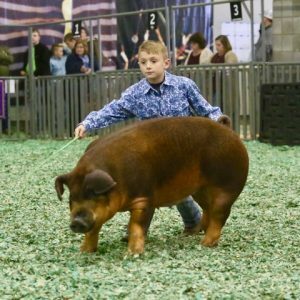 The American Royal Livestock Show continues to be one of the largest livestock shows in the nation and attracts exhibitors showing the best livestock from across the country. This year the event was held October 19 – 30 at the American Royal Complex and welcomed 1,742 exhibitors from 30 states. 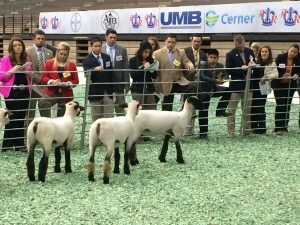 In comparison to previous years, with consistent numbers in other categories, the event increased in the number of entries for lambs, pedigreed gilts, and goats. 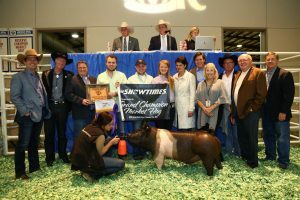 Grand Champion Market Hogs, Khyleigh North with members of the American Royal Board of Directors. 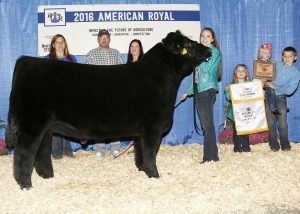 It was also a record setting year for the Junior Premium Livestock Auction. On October 23, 164 loyal supporters of the American Royal gathered in Wagstaff Theatre to congratulate and support the Grand and Reserve Champions of the Livestock Market Shows. It was an inspiring and emotional night as each young exhibitor was acknowledged for their achievement and a record sales total of $732,200 was reached, surpassing the 2015 sales total by nearly $90,000. Special thanks to each auction participant for their on-going and generous support of the American Royal. It is because of their tremendous generosity and support that the American Royal is able to continue to fulfill its mission of impacting the future of agriculture through scholarships, education, and competition. 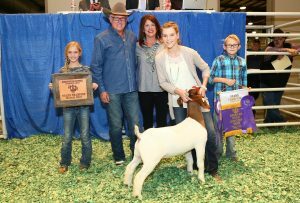 Grand Champion Market Goats, Tara Hummel and family with Brian and Nancy Beaver. Reserve Champion Market Steer, Kassidy Bremer and family. 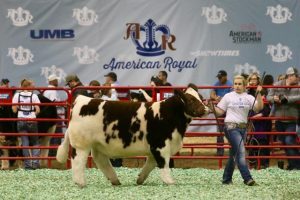 For full results from the Livestock Show visit AmericanRoyal.com.